Scanair India Onion Dryers in India offered power efficient Heat pump technology Dryers Dealers through Chennai, Bangalore, Hyderabad, Pune, Mumbai, New Delhi, Trivandram, Trichy, Indore, Nagpur, Nashik, Vijayawada, Varanasi, Coimbatore, Tirupur, Sivakasi, Salem, Cochin & Ernakulam, Coimbatore, Pune, Kolkata, Goa, Visakhapatnam Vijayawada, Amravati, Kakinada, Nellore, Guntur, Tirupati, Rajhmundry. Heat pump dryer running cost just as 40% of oil burn dryer, 50% of coal burning boiler, 30% of electric boiler. Heat pump dehumidification drying method of the closed cycle, saving costs, no exhaust waste heat emissions, no noise pollution, safe environmental protection. Scanair Onion Dehydrator heat pump Dryer will maintained air temperature range from 20˚ C To + 80˚ C ˚ ± 5˚ C, capacity from 1Kw to 150Kw From 50 CFM to 20000 CFM air flow capacity. Manufactured using high quality material, manufacturer major types of industrial heat pump Dryers can be adapted for application like Heat pump Tray Dryer, Heat pump Drying Oven, Heat pump hot air blower, Heat pump drying chamber, Heat pump drying room, Drying ware house. This is widely used for heating & drying, Dehumidified drier, Drier, Air drier, Dehumidifying dryers, Rotary dryer, Fluidized bed drier, Vacuum dryer, Industrial dryers, Drying equipment Industrial dehumidification, Air dehumidifier, Industrial heating, Industrial drying, Air dryer, Air drying, Air drying system, Air drying unit, Dry air systems, Dehumidifying, Onion slices, Wood drying, Fruit drying, vegetable drying, Fish drying, Meat drying, Drying technology, Drying , Seed drying, Moisture drying , Ageing, and many more application. Our range of these products is designed for parallel placement of the material that results in increase in production and saves batch timing by convenient loading and unloading. This types of Tray Dryer is available with external temperature control panel, low and high temperature with superior quality fabricated products, our range of these products is widely demanded in the market. Moreover, these ovens are available in various models are designed & manufacture to suit customer requirements custom-built models also available. are, air source heat pumps, water source heat pumps, geothermal heat pumps, solar heat pumps. 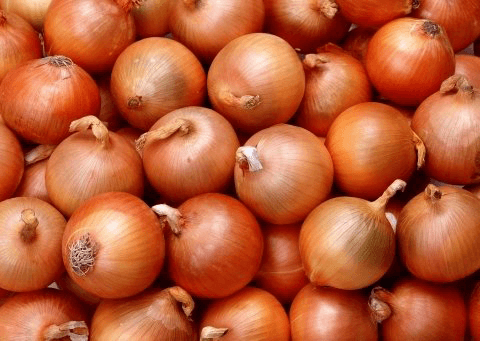 ensure the sound application of Onion Heat pump dryers in Cochin & Ernakulam, Coimbatore, Pune, Kolkata, Goa, Visakhapatnam Vijayawada, Amravati, Kakinada, Nellore, Guntur, Tirupati, Rajhmundry. industries. These heats pump dryers are ozone friendly, packaged type have been designed for many years of trouble free operation. Heat pump Air Heaters are ideal and suitable for drying Onion,Ginger, Mushroom, Herbs, Garlic, cardamom, pepper, spices, potato chips, onions, fish, meat, sea foods, garlic, grapes, cashew nuts, confectionery, macaroni, vermicelli, noodles, etc. It is also for used for drying pharmaceuticals powder, chemical powders, granules, plastic granules, powder coating etc,. 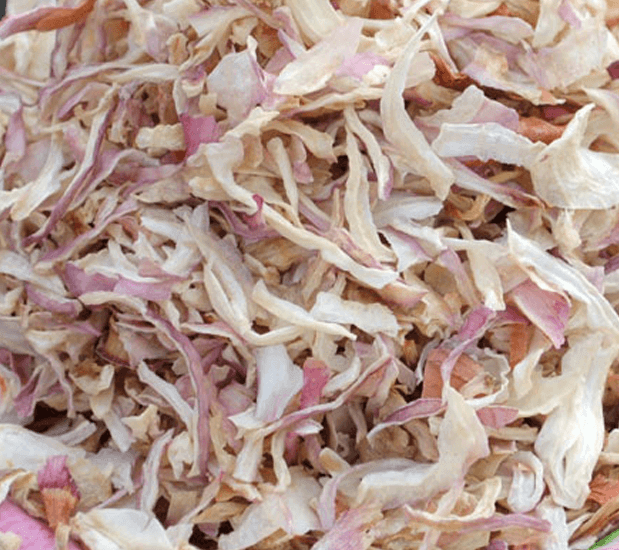 Onion Powder, Onion flakes or slices are Sun drying is not recommended because it can lose flavor and color and its need to be dried at low temperatures (15 to 45˚C) for product quality optimization. This is an important consideration as they have a relatively high commercial value. Heating ambient air to use for, drying, although a simple cost-effective procedure is of limited application, particularly at higher ambient air relative humidity because of the low allowable maximum temperature conditions. Under high ambient moist air conditions, it may not even be possible to dry the material by conventional means. High temperature drying deteriorates the material structure and can render it unsuitable for further use. Low temperature drying of specialty crops reduces the risk of loss in nutrient content and damage to physical properties. Drying system incorporating a dehumidification cycle have been developed that both conserve energy and handle the material gently. The dryer operates using a heat pump where both sensible and latent heats are recovered from the exhaust air. The heat is then recycled back through the dryer by heating the air entering the dryer. The heat pump drying system is a combination of two sub-systems, a heat pump and a dryer. Scanair India Ginger Dryers in India offered power efficient Heat pump technology Dryers Dealers through Chennai, Bangalore, Hyderabad, Pune, Mumbai, New Delhi, Trivandram, Trichy, Indore, Nagpur, Nashik, Vijayawada, Varanasi, Coimbatore, Tirupur, Sivakasi, Salem,Cochin & Ernakulam, Coimbatore, Pune, Kolkata, Goa, Visakhapatnam Vijayawada, Amravati, Kakinada, Nellore, Guntur, Tirupati, Rajhmundry. Heat pump dryer running cost just as 40% of oil burn dryer, 50% of coal burning boiler, 30% of electric boiler. Heat pump dehumidification drying method of the closed cycle, saving costs, no exhaust waste heat emissions, no noise pollution, safe environmental protection. 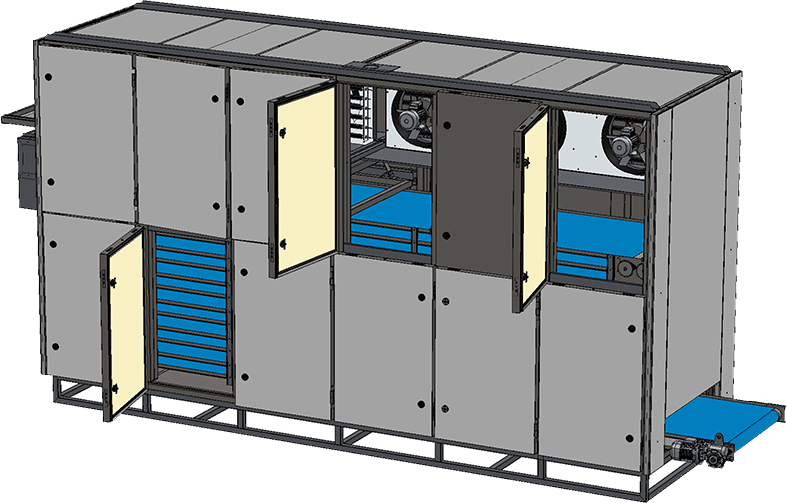 Scanair Ginger Dehydrator heat pump Dryer will maintained air temperature range from 20˚ C To + 80˚ C ˚ ± 5˚ C, capacity from 1Kw to 150Kw From 50 CFM to 20000 CFM air flow capacity. Manufactured using high quality material, manufacturer major types of industrial heat pump Dryers can be adapted for application like Heat pump Tray Dryer, Heat pump Drying Oven, Heat pump hot air blower, Heat pump drying chamber, Heat pump drying room, Drying ware house. This is widely used for heating & drying, Dehumidified drier, Drier, Air drier, Dehumidifying dryers, Rotary dryer, Fluidized bed drier, Vacuum dryer, Industrial dryers, Drying equipment Industrial dehumidification, Air dehumidifier, Industrial heating, Industrial drying, Air dryer, Air drying, Air drying system, Air drying unit, Dry air systems, Dehumidifying, Ginger slices, Wood drying, Fruit drying, vegetable drying, Fish drying, Meat drying, Drying technology, Drying , Seed drying, Moisture drying , Ageing, and many more application. Our range of these products is designed for parallel placement of the material that results in increase in production and saves batch timing by convenient loading and unloading. This types of Tray Dryer is available with external temperature control panel, low and high temperature with superior quality fabricated products, our range of these products is widely demanded in the market. Moreover, these ovens are available in various models are designed & manufacture to suit customer requirements custom-built models also available. are, air source heat pumps, water source heat pumps, geothermal heat pumps, solar heat pumps. ensure the sound application of Ginger Heat pump dryers in Cochin & Ernakulam, Coimbatore, Pune, Kolkata, Goa, Visakhapatnam Vijayawada, Amravati, Kakinada, Nellore, Guntur, Tirupati, Rajhmundry. industries. These heats pump dryers are ozone friendly, packaged type have been designed for many years of trouble free operation. Heat pump Air Heaters are ideal and suitable for drying Ginger, Mushroom, Herbs, chilies, cardamom, pepper, spices, potato chips, onions, fish, meat, sea foods, garlic, grapes, cashew nuts, confectionery, macaroni, vermicelli, noodles, etc. It is also for used for drying pharmaceuticals powder, chemical powders, granules, plastic granules, powder coating etc,. 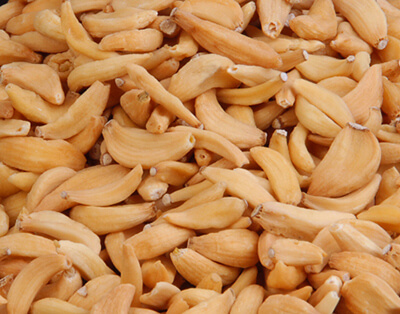 Ginger, Ginger slices, Sun drying is not recommended because it can lose flavor and color and its need to be dried at low temperatures (15 to 45˚C) for product quality optimization. This is an important consideration as they have a relatively high commercial value. Heating ambient air to use for, drying, although a simple cost-effective procedure is of limited application, particularly at higher ambient air relative humidity because of the low allowable maximum temperature conditions. Under high ambient moist air conditions, it may not even be possible to dry the material by conventional means. High temperature drying deteriorates the material structure and can render it unsuitable for further use. Low temperature drying of specialty crops reduces the risk of loss in nutrient content and damage to physical properties. Drying system incorporating a dehumidification cycle have been developed that both conserve energy and handle the material gently. The dryer operates using a heat pump where both sensible and latent heats are recovered from the exhaust air. The heat is then recycled back through the dryer by heating the air entering the dryer. The heat pump drying system is a combination of two sub-systems, a heat pump and a dryer. Scanair India Mushroom Dryers in India offered power efficient Heat pump technology Dryers Dealers through Chennai, Bangalore, Hyderabad, Pune, Mumbai, New Delhi, Trivandram, Trichy, Indore, Nagpur, Nashik, Vijayawada, Varanasi, Coimbatore, Tirupur, Sivakasi, Salem,Cochin & Ernakulam, Coimbatore, Pune, Kolkata, Goa, Visakhapatnam Vijayawada, Amravati, Kakinada, Nellore, Guntur, Tirupati, Rajhmundry. Heat pump dryer running cost just as 40% of oil burn dryer, 50% of coal burning boiler, 30% of electric boiler. Heat pump dehumidification drying method of the closed cycle, saving costs, no exhaust waste heat emissions, no noise pollution, safe environmental protection. Scanair Mushroom heat pump Dryer air heaters will maintained air temperature range from 20˚ C To + 80˚ C ˚ ± 5˚ C, capacity from 1Kw to 150Kw From 50 CFM to 20000 CFM air flow capacity. Manufactured using high quality material, manufacturer major types of industrial heat pump Dryers can be adapted for application like Heat pump Tray Dryer, Heat pump Drying Oven, Heat pump hot air blower, Heat pump drying chamber, Heat pump drying room, Drying ware house. This is widely used for heating & drying, Dehumidified drier, Drier, Air drier, Dehumidifying dryers, Rotary dryer, Fluidized bed drier, Vacuum dryer, Industrial dryers, Drying equipment Industrial dehumidification, Air dehumidifier, Industrial heating, Industrial drying, Air dryer, Air drying, Air drying system, Air drying unit, Dry air systems, Dehumidifying, Wood drying, Fruit drying, vegetable drying, Fish drying, Meat drying, Drying technology, Drying , Seed drying, Moisture drying , Ageing, and many more application. Our range of these products is designed for parallel placement of the material that results in increase in production and saves batch timing by convenient loading and unloading. This types of Tray Dryer is available with external temperature control panel, low and high temperature with superior quality fabricated products, our range of these products is widely demanded in the market. Moreover, these ovens are available in various models are designed & manufacture to suit customer requirements custom-built models also available. are, air source heat pumps, water source heat pumps, geothermal heat pumps, solar heat pumps. ensure the sound application of Mushroom Heat pump dryers in Cochin & Ernakulam, Coimbatore, Pune, Kolkata, Goa, Visakhapatnam Vijayawada, Amravati, Kakinada, Nellore, Guntur, Tirupati, Rajhmundry. industries. These heats pump dryers are ozone friendly, packaged type have been designed for many years of trouble free operation. Heat pump Air Heaters are ideal and suitable for drying Mushroom, Herbs, chilies, cardamom, pepper, spices, potato chips, onions, fish, meat, sea foods, garlic, grapes, cashew nuts, confectionery, macaroni, vermicelli, noodles, etc. It is also for used for drying pharmaceuticals powder, chemical powders, granules, plastic granules, powder coating etc,. 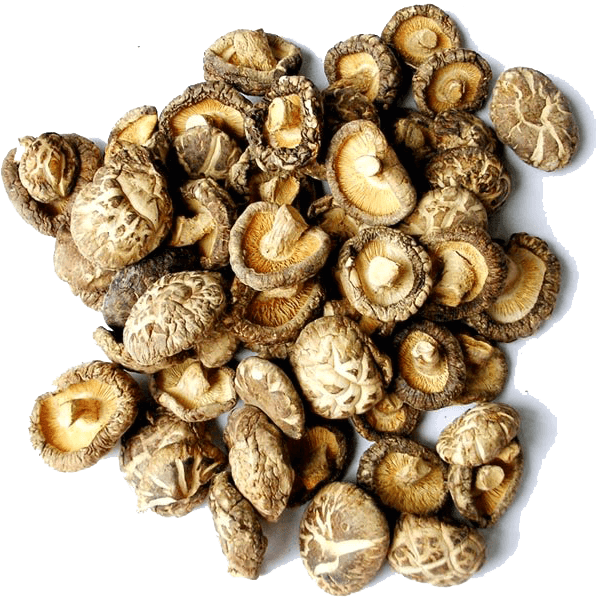 Mushroom Sun drying is not recommended because it can lose flavor and color and its need to be dried at low temperatures (15 to 45˚C) for product quality optimization. This is an important consideration as they have a relatively high commercial value. Heating ambient air to use for, drying, although a simple cost-effective procedure is of limited application, particularly at higher ambient air relative humidity because of the low allowable maximum temperature conditions. Under high ambient moist air conditions, it may not even be possible to dry the material by conventional means. High temperature drying deteriorates the material structure and can render it unsuitable for further use. Low temperature drying of specialty crops reduces the risk of loss in nutrient content and damage to physical properties. Drying system incorporating a dehumidification cycle have been developed that both conserve energy and handle the material gently. The dryer operates using a heat pump where both sensible and latent heats are recovered from the exhaust air. The heat is then recycled back through the dryer by heating the air entering the dryer. The heat pump drying system is a combination of two sub-systems, a heat pump and a dryer. Scanair Heat Pump Dryers in Bhopal offered power efficient Heat pump Dryer Dealers through Madhya Pradesh in Bhopal, Indore, Jabalpur , Heat pump dryer running cost just as 40% of oil burn dryer, 50% of coal burning boiler, 30% of electric boiler. Heat pump dehumidification drying method of the closed cycle, saving costs, no exhaust waste heat emissions, no noise pollution, safe environmental protection. Scanair heat pump Dryer air heaters will maintained air temperature range from 20˚ C To + 80˚ C ˚ ± 5˚ C, capacity from 1Kw to 150Kw From 50 CFM to 20000 CFM air flow capacity. Manufactured using high quality material, manufacturer major types of industrial heat pump Dryers can be adapted for application like Heat pump Tray Dryer, Heat pump Drying Oven, Heat pump hot air blower, Heat pump drying chamber, Heat pump drying room, Drying ware house. This is widely used for heating & drying, Dehumidified drier, Drier, Air drier, Dehumidifying dryers, Rotary dryer, Fluidized bed drier, Vacuum dryer, Industrial dryers, Drying equipment Industrial dehumidification, Air dehumidifier, Industrial heating, Industrial drying, Air dryer, Air drying, Air drying system, Air drying unit, Dry air systems, Dehumidifying, Wood drying, Fruit drying, vegetable drying, Fish drying, Meat drying, Drying technology, Drying , Seed drying, Moisture drying , Ageing, and many more application. Our range of these products is designed for parallel placement of the material that results in increase in production and saves batch timing by convenient loading and unloading. 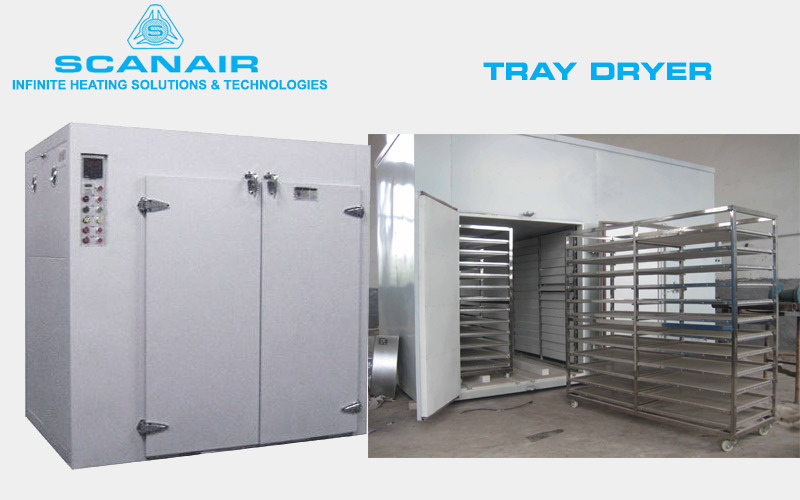 This types of Tray Dryer is available with external temperature control panel, low and high temperature with superior quality fabricated products, our range of these products is widely demanded in the market. Moreover, these ovens are available in various models are designed & manufacture to suit customer requirements custom-built models also available.are, air source heat pumps, water source heat pumps, geothermal heat pumps, solar heat pumps. ensure the sound application of Heat pump dryers in Bhopal, Indore, Jabalpur industries. 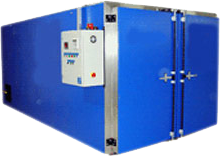 These heats pump dryers are ozone friendly, packaged type have been designed for many years of trouble free operation. Heat pump Air Heaters are ideal and suitable for drying Herbs, chilies, cardamom, pepper, spices, potato chips, onions, fish, meat, sea foods, garlic, grapes, cashew nuts, confectionery, macaroni, vermicelli, noodles, etc. It is also for used for drying pharmaceuticals powder, chemical powders, granules, plastic granules, powder coating etc,. Pharmaceuticals, herbs, cardamom, fish, Sun drying is not recommended because the herbs can lose flavor and color and its need to be dried at low temperatures (15 to 45˚C) for product quality optimization. This is an important consideration as they have a relatively high commercial value. Heating ambient air to use for, drying, although a simple cost-effective procedure is of limited application, particularly at higher ambient air relative humidity because of the low allowable maximum temperature conditions. Under high ambient moist air conditions, it may not even be possible to dry the material by conventional means. High temperature drying deteriorates the material structure and can render it unsuitable for further use. Low temperature drying of specialty crops reduces the risk of loss in nutrient content and damage to physical properties. Drying system incorporating a dehumidification cycle have been developed that both conserve energy and handle the material gently. The dryer operates using a heat pump where both sensible and latent heats are recovered from the exhaust air. The heat is then recycled back through the dryer by heating the air entering the dryer. The heat pump drying system is a combination of two sub-systems, a heat pump and a dryer. 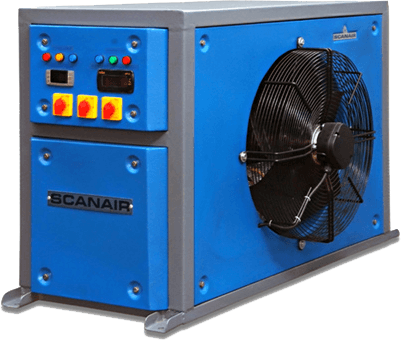 Scanair Heat Pump Dryers in Ahmedabad offered power efficient Heat pump Dryer Dealers through Gujarat State in Ahmedabad, Rajkot, Surat, Bhavnagar, Vadodara,. Heat pump dryer running cost just as 40% of oil burn dryer, 50% of coal burning boiler, 30% of electric boiler. Heat pump dehumidification drying method of the closed cycle, saving costs, no exhaust waste heat emissions, no noise pollution, safe environmental protection. 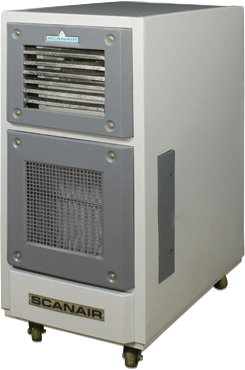 Scanair heat pump Dryer air heaters will maintained air temperature range from 20˚ C To + 80˚ C ˚ ± 5˚ C, capacity from 1Kw to 150Kw From 50 CFM to 20000 CFM air flow capacity. 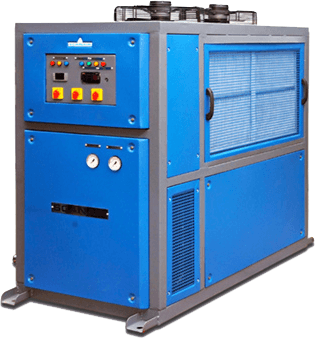 Manufactured using high quality material, manufacturer major types of industrial heat pump Dryers can be adapted for application like Heat pump Tray Dryer, Heat pump Drying Oven, Heat pump hot air blower, Heat pump drying chamber, Heat pump drying room, Drying ware house. This is widely used for heating & drying, Dehumidified drier, Drier, Air drier, Dehumidifying dryers, Rotary dryer, Fluidized bed drier, Vacuum dryer, Industrial dryers, Drying equipment Industrial dehumidification, Air dehumidifier, Industrial heating, Industrial drying, Air dryer, Air drying, Air drying system, Air drying unit, Dry air systems, Dehumidifying, Wood drying, Fruit drying, vegetable drying, Fish drying, Meat drying, Drying technology, Drying , Seed drying, Moisture drying , Ageing, and many more application. Our range of these products is designed for parallel placement of the material that results in increase in production and saves batch timing by convenient loading and unloading. This types of Tray Dryer is available with external temperature control panel, low and high temperature with superior quality fabricated products, our range of these products is widely demanded in the market. Moreover, these ovens are available in various models are designed & manufacture to suit customer requirements custom-built models also available.are, air source heat pumps, water source heat pumps, geothermal heat pumps, solar heat pumps. ensure the sound application of Heat pump dryers in Ahmedabad, Rajkot, Surat, Bhavnagar, Vadodara, industries. These heats pump dryers are ozone friendly, packaged type have been designed for many years of trouble free operation. Heat pump Air Heaters are ideal and suitable for drying Herbs, chilies, cardamom, pepper, spices, potato chips, onions, fish, meat, sea foods, garlic, grapes, cashew nuts, confectionery, macaroni, vermicelli, noodles, etc. It is also for used for drying pharmaceuticals powder, chemical powders, granules, plastic granules, powder coating etc,. Pharmaceuticals, herbs, cardamom, fish, Sun drying is not recommended because the herbs can lose flavor and color and its need to be dried at low temperatures (15 to 45˚C) for product quality optimization. This is an important consideration as they have a relatively high commercial value. Heating ambient air to use for, drying, although a simple cost-effective procedure is of limited application, particularly at higher ambient air relative humidity because of the low allowable maximum temperature conditions. Under high ambient moist air conditions, it may not even be possible to dry the material by conventional means. High temperature drying deteriorates the material structure and can render it unsuitable for further use. Low temperature drying of specialty crops reduces the risk of loss in nutrient content and damage to physical properties. Drying system incorporating a dehumidification cycle have been developed that both conserve energy and handle the material gently. The dryer operates using a heat pump where both sensible and latent heats are recovered from the exhaust air. The heat is then recycled back through the dryer by heating the air entering the dryer. The heat pump drying system is a combination of two sub-systems, a heat pump and a dryer. Scanair india one of the leading manufacturers and suppliers Vegetable Dehydrator, Vegetable Dryer in Bangalore offered cost effective Vegetable Dehydration Plants Dealers through Karnataka state Scanair manufacture a wide range of Vegetable Dryer Machine like Tray Dryer/ Drying Oven with attached heat pump dryer that is widely used for heating, ageing, drying and many more purpose. Our range of these ovens is designed for parallel placement of the material that results in increase in production and saves batch timing by convenient loading and unloading. This types of Tray Dryer is available with external temperature control panel, and high temperature can also be fabricated. Owing to the superior quality of our products, our range of these products is widely demanded in the market. Moreover, these ovens are available in various sizes and models to choose them. 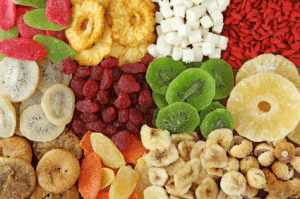 To obtain a high quality dried product, fruits, vegetables and meats need to be prepared before drying. Good preparation practices are a prerequisite for the final dried product quality. Fruits and vegetables must be washed prior to drying to remove soil and other foreign materials. Damaged parts must be removed. Fruits and vegetable should be peeled and cut into small, uniform pieces. Fish should be de scaled and in some cases skinned before cutting into uniform pieces. The smaller the food piece, the faster it will dry. Selecting the appropriate temperature for drying is very important for good product quality too high temperatures can lead to product darkening, discoloration and case hardening. Too low temperatures can lead to slow drying and food spoilage. 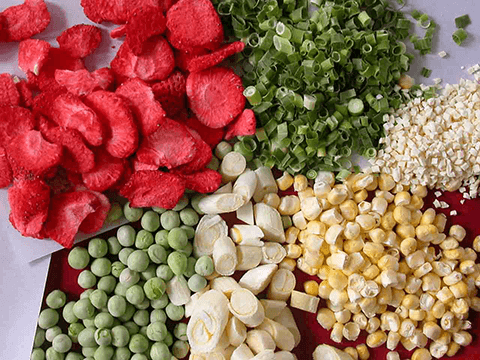 A good, safe temperature for drying many foods like above is 40 – 60˚C. However this must also be accompanied by good air movement through the dryer. Heat pump drying technology applied to food materials, on the one hand the past on the food to heat sensitive materials, usually freeze-drying, drying costs are too high the other hand, moderate heat pump drying of the drying conditions, drying parameters can be easy to control, and freeze-drying can be quality of similar products. Moreover, the heat pump drying can better maintain the quality of dry products, the heat pump drying in a closed structure, vitamins and other nutrients are retained in the drying of volatile components will not escape Heat pump drying of materials used in food shortage cannot be ignored. First, the sensitivity of the food materials used in dry, easily oxidized material (such as flavor compounds and fatty acids) will produce in the dry oxidation process, the flavor, color and rehydration are worse. Second, the heat pump drying also belongs to convective drying is more suitable for drying granular materials, Heat pump drying of food material present study are: using the new drying medium, through the application of inert gas to replace air as the drying medium, the resulting dry product during the drying process will not produce oxidation reaction, the product quality is further improved. 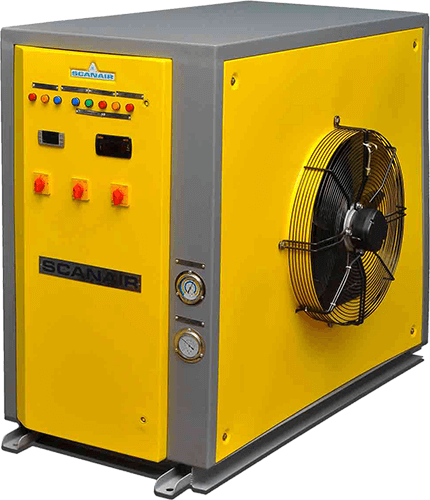 Dehumidification Food Dryers 30°c to 80°c Scanair Vegetable Dehydrator ideal and most suitable for a wide spectrum of applications in Bangalore, Mangalore, Udupi, Mysore, Hubli, Belgaum, Tumakuru, Shivamoga, Davangere We offer industrial scale heat pump food dehydrator systems to dry any product that is ideally dried between 30°c and 80°c Gentle, low temperature and controlled drying means consistent, high quality output. Ideal to preserve color and taste of food products low operating costs due to very high energy efficiency (up to 60% reduction in energy costs versus traditional drying technologies). Less energy use also means less waste heat generated in the space where the dryer operates, further increasing operating savings. As opposed to solar drying, the drying temperature and humidity is not affected by ambient conditions. Every day is a perfect drying day the drying systems consist of a dehumidifier a chamber and product trays. Depending on the type of product and the amount of moisture that needs to be removed, these items are combined into a system. As part of our service, we can work together with you to determine the optimal drying cycle and design the best drying system for your product. Below we describe each of the components and some common combinations, our standard units. 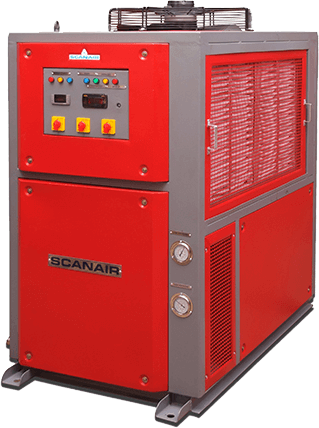 Scanair heat pump Dryer air heaters will maintained air temperature range from 20˚ C To + 80˚ C ˚ ± 5˚ C, capacity from 1Kw to 150Kw From 50 CFM to 20000 CFM air flow capacity. Scanair india one of the leading manufacturers and suppliers Heat Pump Dryers in Mumbai offered cost effective Heat pump dryer Dealers through Maharashtra State Manufactured using high quality material, manufacturer major types of industrial heat pump Dryers can be adapted for application like Heat pump Tray Dryer, Heat pump Drying Oven, Heat pump hot air blower, Heat pump drying chamber, Heat pump drying room, Drying ware house. This is widely used for heating & drying, Dehumidified drier, Drier, Air drier, Dehumidifying dryers, Rotary dryer, Fluidized bed drier, Vacuum dryer, Industrial dryers, Drying equipment Industrial dehumidification, Air dehumidifier, Industrial heating, Industrial drying, Air dryer, Air drying, Air drying system, Air drying unit, Dry air systems, Dehumidifying, Wood drying, Fruit drying, vegetable drying, Fish drying, Meat drying, Drying technology, Drying , Seed drying, Moisture drying , Ageing, and many more application. Our range of these products is designed for parallel placement of the material that results in increase in production and saves batch timing by convenient loading and unloading. This types of Tray Dryer is available with external temperature control panel, low and high temperature with superior quality fabricated products, our range of these products is widely demanded in the market. 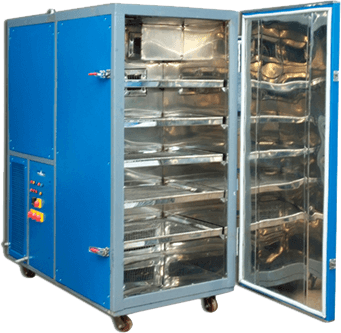 Moreover, these ovens are available in various models are designed & manufacture to suit customer requirements custom-built models also available. are, air source heat pumps, water source heat pumps, geothermal heat pumps, solar heat pumps. ensure the sound application of Heat pump dryers in Mumbai, Pune, Nagpur, Aurangabad, Nashik, Nanded industries. These heats pump dryers are ozone friendly, packaged type have been designed for many years of trouble free operation. Heat pump Air Heaters are ideal and suitable for drying Herbs, chilies, cardamom, pepper, spices, potato chips, onions, fish, meat, sea foods, garlic, grapes, cashew nuts, confectionery, macaroni, vermicelli, noodles, etc. It is also for used for drying pharmaceuticals powder, chemical powders, granules, plastic granules, powder coating etc,. Pharmaceuticals, herbs, cardamom, fish, Sun drying is not recommended because the herbs can lose flavor and color and its need to be dried at low temperatures (15 to 45˚C) for product quality optimization. This is an important consideration as they have a relatively high commercial value. Heating ambient air to use for, drying, although a simple cost-effective procedure is of limited application, particularly at higher ambient air relative humidity because of the low allowable maximum temperature conditions. Under high ambient moist air conditions, it may not even be possible to dry the material by conventional means. High temperature drying deteriorates the material structure and can render it unsuitable for further use. Low temperature drying of specialty crops reduces the risk of loss in nutrient content and damage to physical properties. Drying system incorporating a dehumidification cycle have been developed that both conserve energy and handle the material gently. The dryer operates using a heat pump where both sensible and latent heats are recovered from the exhaust air. The heat is then recycled back through the dryer by heating the air entering the dryer. The heat pump drying system is a combination of two sub-systems, a heat pump and a dryer. Scanair india one of the most popular manufacturers and suppliers Heat Pump Water Heater in Hyderabad offered power efficient Heat pumps Dealers through Andhra Pradesh, Telangana, Hyderabad, Visakhapatnam Vijayawada, Amravati, Kakinada, Nellore, Guntur, Tirupati, Rajhmundry, Srikakulam, Nizamabad, Kurnool, karim nager. Scanair heat pump water heaters are equipped with digital temperature controller to see the temperature and it can be adjustable in order that you will be able to use water with a desired temperature. Heat pump water heaters are not only advantageous for domestic application but also proven to be extremely helpful in other industrial uses. What makes such technology appealing and worth the investment is the fact that it can be used on both extreme environmental temperatures whether it is winter months or summer days. You will be saving a lot on installation as well the purchase of equipment. Scanair heat pumps will maintained Temperature range from 25˚ C To + 65˚ C ˚ ± 1˚ C, capacity from 1Kw to 150Kw From5LPM to 300LPM with different flow capacity. Scanair Heat pumps fabricated through Easy and practical to open side panels for servicing and plumbing, refrigeration accessories, electrical accessories. 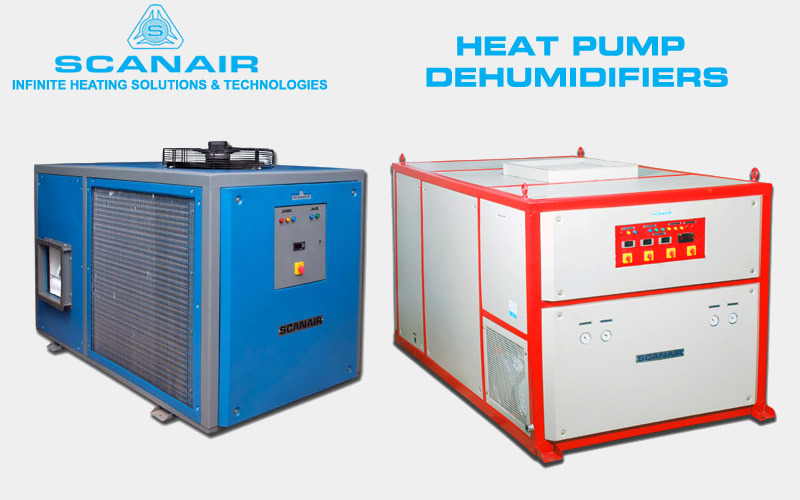 Scanair manufacturer major types of industrial heat pumps are, air source heat pumps, water source heat pumps, geothermal heat pumps, solar heat pumps. ensure the sound application of Heat pumps in Hyderabad, Visakhapatnam Vijayawada, Amravati, Kakinada, Nellore industry, processes should be optimized and integrated. Through process integration improved energy efficiency is achieved by thermodynamically optimizing total industrial processes. An important instrument for process integration is pinch analysis, a technology to characterize process heat streams and identify possibilities for heat recovery. Such possibilities may include improved heat exchanger networks, cogeneration and heat pumps. Pinch analysis is especially powerful for large, complex processes with multiple operations, and is an excellent instrument to identify sound heat pump opportunities.wide applications in industries like Commercial building water heating, Hotels, Restaurants, theatres, shopping malls and boutiques, Hospitals, Diaries, Canteens, institutions, Hostels, Household water heating, Industrial application pre-heating for seed drying, laundry applications, drying application needs, Swimming pool heating etc,. Scanair india one of the leading manufacturers and suppliers Heat Pump Water Heater in Bangalore offered cost effective Heat pumps Dealers through Karnataka state Scanair heat pump water heaters are equipped with digital temperature controller to see the temperature and it can be adjustable in order that you will be able to use water with a desired temperature. Heat pump water heaters are not only advantageous for domestic application but also proven to be extremely helpful in other industrial uses. What makes such technology appealing and worth the investment is the fact that it can be used on both extreme environmental temperatures whether it is winter months or summer days. You will be saving a lot on installation as well the purchase of equipment. Scanair heat pumps will maintained Temperature range from 25˚ C To + 65˚ C ˚ ± 1˚ C, capacity from 1Kw to 150Kw From5LPM to 300LPM with different flow capacity. Scanair Heat pumps fabricated through Easy and practical to open side panels for servicing and plumbing, refrigeration accessories, electrical accessories. 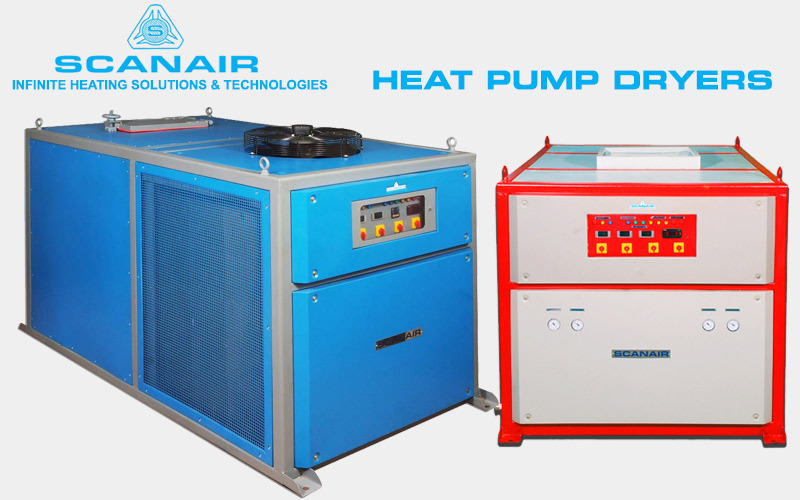 Scanair manufacturer major types of industrial heat pumps are, air source heat pumps, water source heat pumps, geothermal heat pumps, solar heat pumps. ensure the sound application of Heat pumps in Bangalore industry, processes should be optimized and integrated. Through process integration improved energy efficiency is achieved by thermodynamically optimizing total industrial processes. An important instrument for process integration is pinch analysis, a technology to characterize process heat streams and identify possibilities for heat recovery. Such possibilities may include improved heat exchanger networks, cogeneration and heat pumps. Pinch analysis is especially powerful for large, complex processes with multiple operations, and is an excellent instrument to identify sound heat pump opportunities.wide applications in industries like Commercial building water heating, Hotels, Restaurants, theatres, shopping malls and boutiques, Hospitals, Diaries, Canteens, institutions, Hostels, Household water heating, Industrial application pre-heating for seed drying, laundry applications, drying application needs, Swimming pool heating etc,.